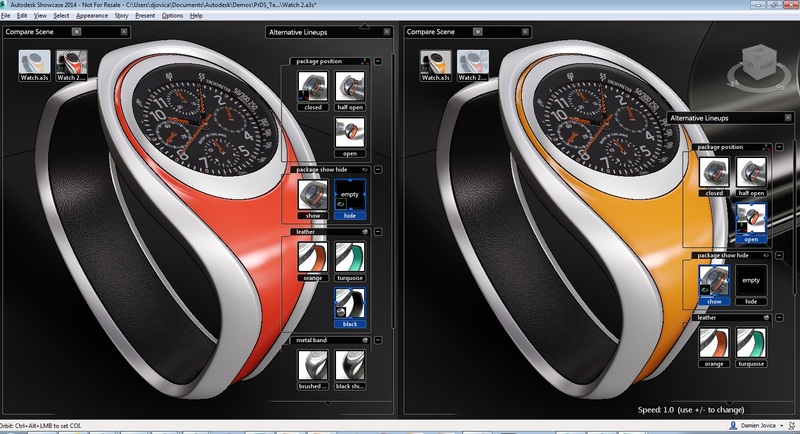 Home » Autodesk 360 » Autodesk Showcase – More Than Just Rendering But Is It Better Than Keyshot? djovica January 22, 2014 April 20, 2016 No Comments on Autodesk Showcase – More Than Just Rendering But Is It Better Than Keyshot? Showcase, once a $40k platform, is now an affordable HDRI Visualisation tool, but is it as good as Keyshot? It opens all major CAD formats, has Kiosk features via the web or ipad, updating scene’s if the model changes without loss of work, photo-realistic rendering and animation capabilities. Keyshot has been an great choice for users of 3D CAD packages because it’s easy to use, provides plug-ins, has the visualisation capabilities that most CAD vendors do not offer and it’s affordable too, but how does it stack up to Showcase? There are cheaper versions of Keyshot, with limited features starting at $995, but these two listed above seem to be the most comparable. 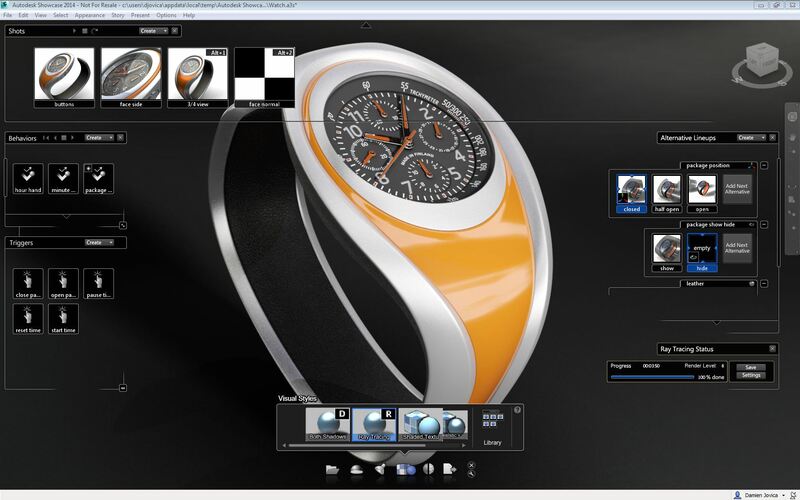 Autodesk Showcase is bundled with any Autodesk Design Suite. So if you want to do Photorealistic images and movies, both are a great choice. Alternate Views: Showcase has an alternate views section that you can alternate views and by clicking on each view, dynamically change what the visualisation looks like. Imports Moving Constraints: You can import multiple mate constraints (i.e. an assembly with a hydraulic cylinder that moves in/out). You can then animate constraints as a behaviour. This feature works only with Autodesk Inventor. If you don’t have Inventor, get Product Design Suite, which comes with Inventor & Showcase, open your CAD file in Inventor, create the constraint and via the one-click workflow, send it to Showcase. Kiosk: This is probably the hottest feature in Showcase for a business. You can setup a custom user interface for your website and link Showcase to your site. Visitors can go onto your site change appearances and parts, such as different wheels or sizes and see what their model looks like in real time or you can drive Showcase from a remote location like your iPad. Publish to YouTube, Mobile or the Cloud: Click Publish, and choose from Image, Video, YouTube or The Web. Choosing YouTube means it will connect to your YouTube account and upload the video there. You can also output to Mobile formats like MP4 or offload your rendering to Autodesk 360 Cloud Service for customers on subscription and let their servers do the work. Collaboration Mode: It takes someone with I.T. to understand machine names & ports but you can setup a session where users can log in and collaborate live with your visualisation session. Compare Scenes: With this feature you can view multiple scenes (with different models, environments, lighting, textures, etc.) 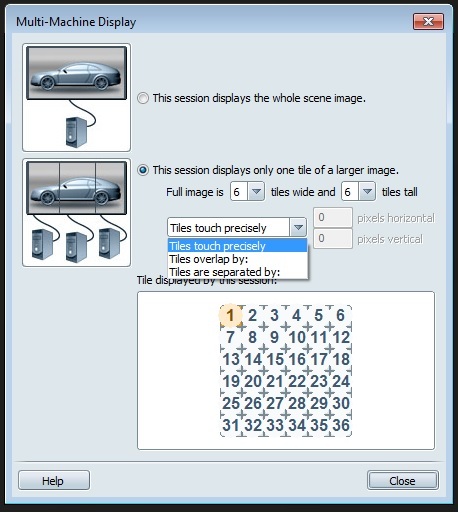 and select each scene to see how they look. There is a Compare Side by Side option where you can make changes to tw scenes and make comparisons. Walk Zone: As the name suggests, you can create a walkthrough scene. Multi-Machine Display: Set up to 3 machines and run Showcase with the power of 3. What’s even better, is that you can run up to 36 tiles and have your image spanned across 2-36 screens. Put Multi-Machine Display together with Kiosk functionality and you can run a big screen on an iPad and showcase your design to your clients in the showroom or boardroom. 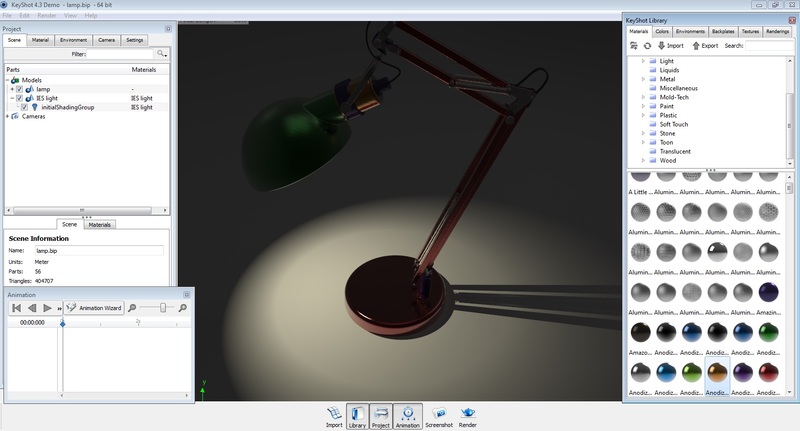 Publish to GrabCAD: You can upload your rendering to GrabCAD similar to what Autodesk users publish to the 360 site, however GrabCAD is a popular site for CAD users. 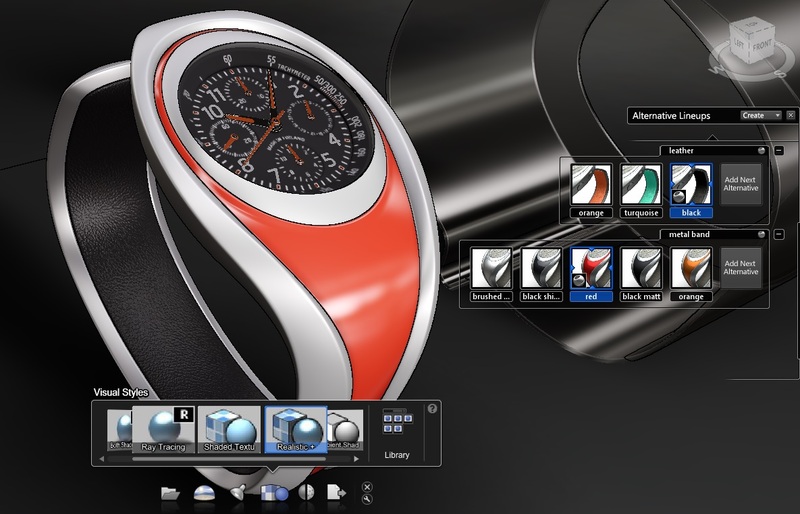 MAC Support & Plug-Ins: Keyshot supports both PC and MAC and on PC it has Plug-ins for various CAD packages. KeyshotVR: Optionally you can buy KeyshotVR and save your rendering as a 3D model (like a DWF file) that you can embed in a website. Animations: I found showcase had the capability to create behaviours and triggers which you can then animate into a movie. You can also do cross sections and show the animated movement inside the model. There is also an Augmented Reality Plug-In for Showcase. 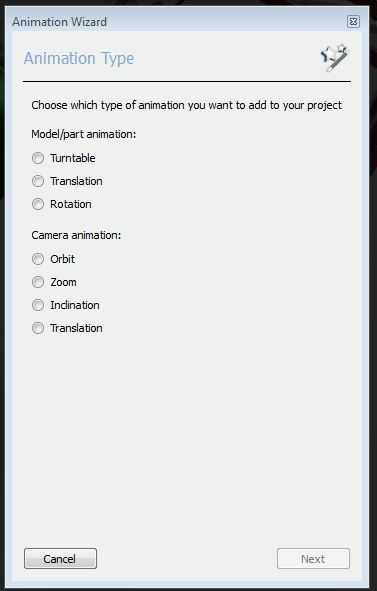 In Keyshot, I only found the Animation Wizard to be able to do the basics; Turntable,Translation, Rotation, etc. Visual Styles: Keyshot allows two settings, Performance Mode and Ray Tracing, where as Showcase has Raytracing, Toon, Ambient Shadows, Real Shadows, Both Shadows, Abstract and Diagnostic. It also has a feature where you can import a Autodesk Simulation Study and blend the RGB Simulation colours in a scene. If that doesn’t make any sense, watch this YouTube Video here. User Interface: This sometimes comes down to personal preference, background and experience. Showcase to me has a better UI, that is more graphical and intuitive (text pops up to tell you what to do or what a shortcut key is), a viewport, more settings to modify your visualisation and more options for lighting, mapping and more output formats. Showcase also supports AutoCAD MEP, AutoCAD views as Shots and Revit. It could be my lack of experience in Keyshot, but I couldn’t select a face and change the appearance (texture/material), it would change the whole part, so if I had a cube in Showcase, all 6 faces would have a different appearance, in Keyshot the appearance would be applied to the cube. Performance: My laptop fan started humming when I opened Keyshot and I noticed a performance hit. It looks like it runs Ray Tracing in a low level mode though to make things run quicker. Having said that Showcase slows my computer down too as soon as Ray Tracing is enabled, that humming noise comes back! If you noticed the Showcase images above have captions saying (No Ray Tracing), that’s because I have a laptop with an integrated graphics card and turning on Ray Tracing bogs it down. However, a user can fully customise the Ray Tracing quality settings and the render level they need it to be at. I wrote this blog before I downloaded Keyshot, not knowing what to expect. If you look at both websites, you’d think they were the similar beasts, which they are to a certain extent. It seems Showcase had a reason to be worth $40k back in the old days. There’s some key advantages in using Showcase over Keyshot. I don’t think it’s up there with VRED (PI-VR) or other High-End Visualisation Software but it gives any other renderer a good run for it’s money. I wish I had more to say about how great Keyshot is. In the Aussie market, it’s got a good following, but I’m sorry Keyshot fans, Showcase make it look ordinary and makes me appreciate having Showcase that much more. Autodesk will be releasing Showcase 360 which will be a cloud based renderer, negating the requirement to run high-end hardware or chew up resources, so I can run Ray Tracing at High Quality! I don’t know if it will have all the features of the local machine version, but stay tuned, the Beta is coming soon. If my guess is correct, they’ll incorporate Fusion 360 with Showcase 360. If you’re an experienced Keyshot user and I’ve missed something that Keyshot does, please provide commentary so I can correct it. Take the Fake or Foto Challenge.